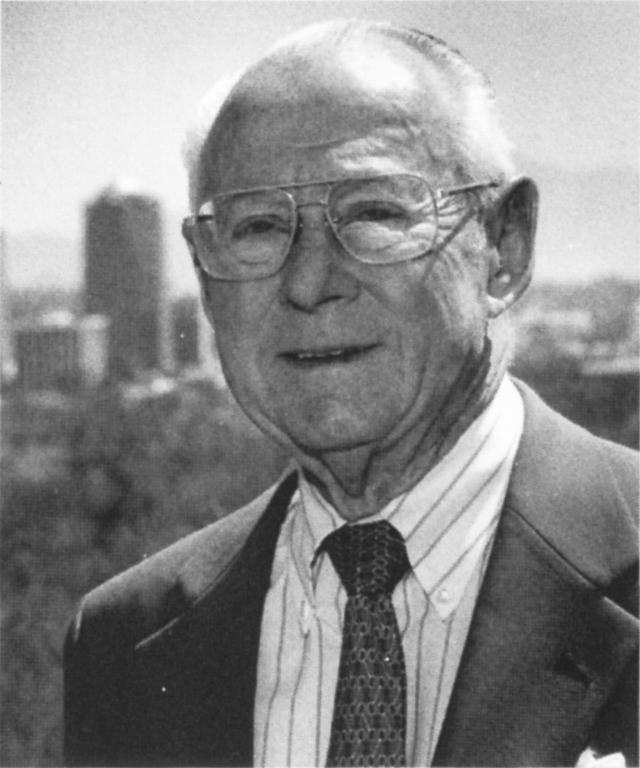 Roy P. Drachman is synonymous with the development of his native Tucson. Born at the family home on July 31, 1906, he was raised and educated in Tucson. Roy’s father, Emanuel Drachman, who brought the first motion picture projector to Arizona, became seriously ill at the beginning of Roy’s sophomore year at the University of Arizona, and Roy left college to manage his father’s theater business. With the advent of air conditioning, young entrepreneurs like Mr. Drachman realized that the Arizona climate was worth promoting. In 1939, Roy became manager of the Tucson Sunshine Climate Club, an organization working in conjunction with the Chamber of Commerce to promote tourism and Tucson’s healthy climate. While the Sunshine Club was promoting health and tourism, Tucson’s medical facilities were lacking. Roy was appointed as chairman of the campaign to raise the funds that established the Tucson Medical Center. Before being drafted into World War II in 1944, with a wife and two children at home, Roy worked vigorously on two stadium events to sell war bonds that raised over six million dollars. Upon his return to Tucson in 1946, Roy decided to establish his own real estate brokerage business. Roy developed an alliance with L.C. Jacobsen and Del Webb and was soon selling houses for Del Webb in Tucson’s first large housing development. Through his membership in the Urban Land Institute, Mr. Drachman became an early pioneer in a new phenomenon called the “shopping center.” Together, he and Del Webb co-developed the first shopping centers in Arizona. These included Tucson’s Swanway Plaza as well as Uptown Plaza and Park Central in Phoenix. Another mall they developed in Phoenix was Christown, the first enclosed mall west of the Rockies. Credited with bringing major businesses such as the Hughes Corporation to Tucson, Mr. Drachman was an original partner in Ramada Inns. Through his combined love of Tucson and sports, Roy, who played semi-pro baseball, was instrumental in bringing major league baseball spring training not only to Tucson, but Arizona. He helped launch the Conquistadors, hosts of the Tucson Open Golf Tournament. Mr. Drachman was the recipient of numerous Realtor of the Year awards, served as the third president of the International Council of Shopping Centers, was president of the Urban Land Institute, served on the Realtors Washington Committee for 15 years, was chairman of the Commission on the Arizona Environment for 13 years, and was inducted into the Arizona Business Hall of Fame. As a staunch supporter of the University of Arizona, he helped raise the funds for the Medical School and donated funds to the cancer center. He founded the Roy P. Drachman Institute for Land and Redevelopment Studies which assists smaller cities with their planning needs. The University of Arizona has honored Mr. Drachman by bestowing upon him an honorary Doctor of Law degree, and the U of A's Roy P. Drachman Track and Field Stadium bears his name in gratitude for his contributions for track facilities.